When Fox News called the election for Barack Obama just before 11:30 p.m., it was the culmination of a night-long sigh by the right-wing network, capped off with a climactic hissy fit steeped in denial, courtesy of Karl Rove. The polls didn’t look good going into the day, but the channel’s well-manicured hosts put on a happy face and crossed their fingers, as they have for weeks now, kicking off Election Night with similar refrains of hope and favorable Internal polling from the Romney campaign, plus predictable mentions of unemployment, Libya, and paths to a win without Ohio. But the excuses started early and then things got weird. O’Reilly also cited Hurricane Sandy as a reason Romney might possibly, maybe lose the election. “If Obama wins, Sandy will have something to do with it,” he predicted. “He got more currency from Sandy than he got negative currency from Libya. That to me is amazing.” But O’Reilly did verbalize the elephant in the room: “If Mitt Romney loses Ohio, the president is reelected,” he dropped with a thud. But as the states started to fall — Pennsylvania, Wisconsin, Minnesota — Romney’s path to a win was described as a “tightrope,” and the mood soured noticeably. Outright predictions gave way to minute dissections of specific counties as anchors Megyn Kelly and Bret Baier seemed to brace for the inevitable. 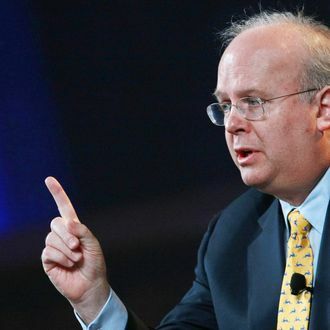 And then went Ohio, and with it, the election — and Karl Rove’s mind. “We have got to be careful about calling things when we have like 991 votes separating the two candidates and a quarter of the vote yet to count,” he said, questioning the network that signs his checks and calling the decision “premature.” Kelly quipped, “That’s awkward,” and then proceeded to march — in an equally awkward scene — away from her desk and into the bowels of the studio to the number-crunching Decision Desk. “We’re actually quite comfortable with the call in Ohio,” one man said, and you could practically hear Rove’s curdled cries in the distance. “There just aren’t enough Republican votes left for Mitt Romney to get there,” another added. Live from Chicago, where the Obama crowd was losing it, Ed Henry managed to get in another, though it went tumbling into the abyss: “They’re almost nearing pandemonium now,” he said, “despite that unemployment is still hovering near 8 percent.” It wasn’t the end of the network’s bitter mix of denial and rationalization for the night, but it might as well have been.